The HGV/LGV driving licence is generally thought of as the most in-demand and versatile commercial driving license to have because it is the category of vehicle normally chosen by a huge diversity of businesses to distribute localised and nationwide deliveries. The licences to drive these types of vehicle are commonly referred to as the Class 2 HGV and Class 1 HGV. New drivers must qualify first for Class 2 HGV vehicles before they can upgrade their driving licence and take the test for an articulated lorry – Class 1 HGV. This means they will also gain the 7.5 tonne driving licence also. Our professional training team of HGV/LGV driving instructors are registered with the DSA and have many years of experience and knowledge of the industry. 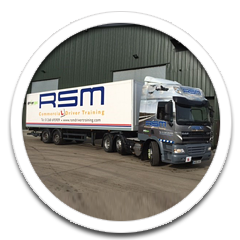 At RSM we provide all classes of HGV/LGV driver training courses on a ONE-to-ONE basis, although we are also able to offer a shared time training scheme if requested. The 7.5 tonne licence is the smallest class of LGV training that a driver can take. Many people are unaware that you are actually able to apply straight for your Category C (Rigid/Class 2) licence without having to sit the practical test for this category first. The process of applying for provisional entitlements and sitting the theory and hazard tests is exactly the same, however if you sit this course and pass the practical test you will only be required to drive a vehicle unto the weight of 7.5 tonne. If you later require your licence to be upgraded you must then sit the course for Category C (Rigid/Class 2). The majority of people who sit this course are those requiring ‘Ambulance Driver Training’ and have no intention of driving a larger vehicle. 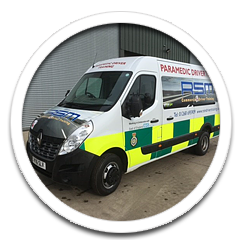 Training for this Category is carried out on our Ambulance sized vehicle. Drivers wishing to tow a trailer on a 7.5 tonne vehicle will be required to sit the C1+E course as an addition. Drivers who wish to upgrade their licence to Category C (Rigid/Class 2) will need to apply for provisional entitlement, sit and pass the LGV Theory Multiple Choice & Hazard Perception tests prior to sitting their driver training course and practical driving test. Please refer to our step-by-step guide below to find out what you need to do or alternatively contact the office and speak to one of the team. Training for this category can be carried out on a manual or automatic training vehicle. Please specify your preference when booking your driver training course. Passing this test will entitle you to drive any rigid vehicle unto 32 tonne. Drivers wishing to take the Category C+E (Artic/Class 1) driver training course must hold a Category C (Rigid/Class 2) licence first. On passing the Category C driving test your licence would have been automatically upgraded to show the provisional ‘C+E’ on it – this means you are not required to apply to the DVSA for it (unless it does not show on your counterpart licence) or sit another LGV Theory or Hazard test. Driving articulated vehicles demands a high level of skill, particularly concerning forward planning and defensive driving techniques. The artic driver training course schedule is similar to that of the LGV Rigid, with the additional requirement to demonstrate your ability to couple and uncouple your vehicle with a trailer. Passing this test will entitle you to drive any vehicle (except PCV) including those towing a trailer. Please note drivers are required to hold the correct provisional entitlement for the vehicle they wish to have an assessment in. 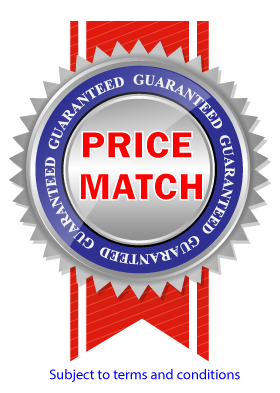 RSM offer a ‘Combination Course’ which will save you money if you book both your Category C (Rigid/Class 2) and Category C+E (Articulated/Class 1) courses together. You could have both licences in as little as 4 weeks! Please contact the office for more details. How long does it take to train for the HGV/LGV driving test? 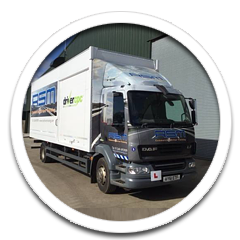 As professional HGV/LGV driving instructors we treat each trainee driver differently; according to their ability, so your HGV training course will be adapted to suit your personal requirements. Typically HGV driver training courses are spread over 5 days with approximately 20 hours of one-to-one driver tuition in one of our well maintained fleet of commercial HGV vehicles. 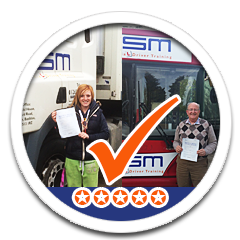 Our driving instructors will teach you to drive a HGV confidently and safely to a high standard of driving, beyond that which is required for the HGV/LGV driving test, in order to give you the best chance of passing your test the first time and being both competent and safe to drive on the road. The HGV/LGV driving test is usually arranged for the fifth day at a local driving test centre. How do I obtain a HGV/LGV Driving Licence? Once you have passed the theory tests we will be pleased to confirm a booking for you on our HGV/LGV driver training course. Simply give us a call or submit your details through the Contact Us page and we will liaise with you to arrange a convenient start date for your driver training. After passing your practical driving test, before you are able to drive commercially, you will need to complete Drivers CPC training in order to obtain your Drivers’ Qualification card. You will need to complete either the Initial CPC OR 35 hours Periodic CPC (depending on your work/how long your licence has been held) before you can drive commercially. You will be required to sit the Module 2: Case Studies & Module 4: Practical Demonstration OR if you have ‘Acquired Rights’ on your licence you will be required to book 35 hours of Periodic CPC Training. There are certain lines of work that are CPC exempt. A CPC Exemption List can be found here. For more information about what CPC you are required to take, visit the CPC page.